"I am your ruler, your king... Your Monarch"
Gerald is blinded by anger and is driven by his passion to make the world his kingdom. He feels entitled to the world due to his upbringing. Because of his performance enhancement drug's primary side effect being insanity, Gerald is also a psycho. As you will see in his story, his anger from being put down all his life and the insanity merge and drive him to kill his family. Gerald was born as the heir to the massive Carlton estate and to the Carl-Corp Company. Being part of such a high society family, Gerald's parents were uptight and usually never there for him. Through the early stages of his life, he was kept with several hundreds of maids and nannies. They had to switch the babysitters out so often because of how bad his tantrums got. Despite despising his parents, he still studied. Hard. Gerald was top of his class in secondary school and never dropped below 98% throughout. Along with getting good grades, he was a star athlete. By 20, Gerald joined the Olympics. He did well, winning a silver medal in athletics, however, this was not good enough. His parents berated him for not getting gold. Gerald was a failure to them. Because of these terrible standards, Gerald snuck into a Carl-Corp Lab. He stole an untested performance enhancement drug that ended up messing with him psychologically. A major side effect of the drug was increased aggression and a weakened mental state. He started plotting. Gerald snuck back into the Carl-Corp lab and stole a high tech Tungsten Carbide rapier, Broadsword, and several other blades. Along with the assortment of bladed weapons, he took a transforming glider that could shift into a shield. It was equipped with powerful explosives that he planned to use against his very own family. Right before the incident, he had some workers construct him a powerful energy scepter that he would use to slay his father who was his primary target. 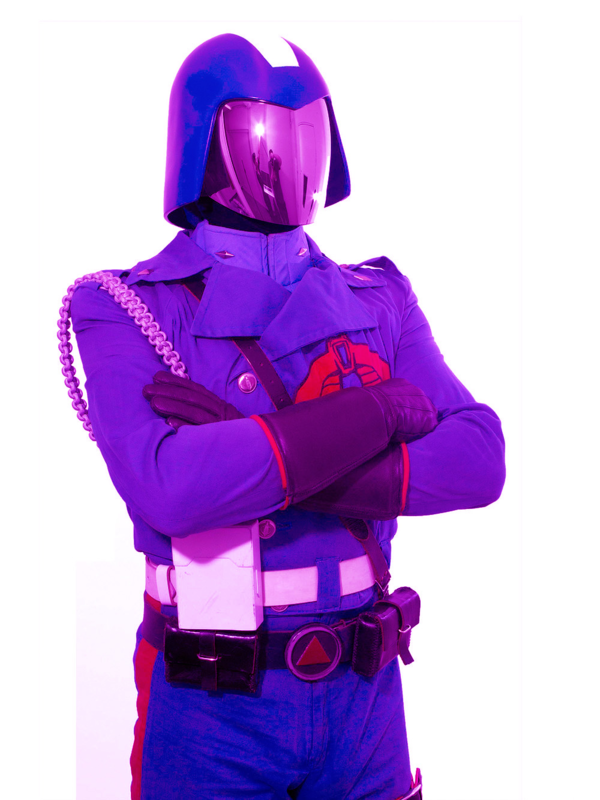 As the workers returned home, the weapons were reported stolen and security footage revealed a man in purple stealing them. The suit was the one Gerald had had fabricated by the same workers. The workers knew and had to be slain. Gerald in his new outfit fired a rocket through each man's bedroom window, killing them as they slept and burning down their neighborhoods. Few made it out and those who did had no clue what had happened. Gerald returned home after the killings and with his new plan finished. Within a few minutes of the attack, the manor was reduced to ashes. But that wasn't the end. He still was affected by his father rebuking him. In order to succeed, he had to become number one. The only way to do so is to become the world's Monarch. Extraordinary Reflexes: Monarch's reflexes are astounding because of the Carl-Corps drug. He's able to dodge firearms well enough to be considered a speedster by some conspiracy theorists. And that leads to the next power. Astounding Agility: The Monarch's agility covers both acrobatics and speed in that he can run at well over 40 miles per hour and perform great acrobatic feats. A truly interesting ability. Supreme Strength: The Monarch's performance-enhancing drug amplified his strength to the point of being able to lift well over a ton. It allows him to deliver jaw-dropping punches that can demolish a human skull without breaking a sweat. Superior Swordsmanship: The Monarch combined with his strength, agility, and reflexes has surpassed the greatest swordsmen to have ever lived. He can slice a bullet in half, dodge, parry, anything a swordsman could do amplified. Monologuing: The Monarch is a victim of monologuing and revealing his evil plans. He'll reveal everything down to a tee. He wants his enemies to know his plan because defeating an enemy at their strongest is the greatest show of power. Weakened Mental State: Being borderline insane, Monarch doesn't hold up so well against telepaths and the like. It's extremely easy to probe his mind. Allergies: Monarch is extremely allergic to cats. He'll break out into hives, have itchy eyes, etc. It's quite distracting, so he hopes his enemies haven't developed a cat bazooka yet. Family Matter: If Monarch's family is brought up, he would go into a blind fury and his skill would be negated. A few words could bring him down. Addiction: The Monarch's performance enhancement drug is quite addictive and will send Monarch into withdrawal if he doesn't take an injection every few hours. 2. Glider: The glider can shift in and out of shield mode based on one of Monarch's gauntlet screens. A few taps will do the trick. 3. Glider Arsenal: The Glider can store all of his blades and also is equipped with several propelled explosives. It has a mounted blaster on the lower edge that can automatically target enemies. Weakness: The Glider's thrusters are a major weak spot and can be taken out with a well-placed shot on a fuel tank. 4. Monarch Suit: Each gauntlet contains several different gadgets including lock picks, vials, built in pads and more. Each glove can fire an energy beam with beam modules in each fingertip. The Gauntlets also have built-in grappling hooks for extra mobility. The suit's material is a nanoweave that can resist medium caliber firearms and bladed weapons. He may be an expert swordsman, but must be prepared for the unexpected. 5. Scepter: The sphere atop Monarch's scepter can fire beams similar to those of his fingertips. These beams are omnidirectional. 6. Halberd-4: The Halberds are a series of thrown explosive devices that are a part of Monarch's arsenal. He can store 10 of these explosives on his glider. They are impact-based explosives and have a 20 foot radius. 7. ThR0-n3: The performance enhancement drug is required to be taken every few hours which is why Monarch always has 2 spares with him. A quick injection into the neck or arm should do. Wealth: Like many of my characters, he's filthy rich and owns a weapons company. This company can manufacture weapons on account of Monarch's alter ego: Gerald Carlton. Drug Dependent: Gerald's dependency on drugs created by Carl-Corp leads him to withdrawal's if he is without his drugs for more than 24 hours. It's a simple pill, and he always has a stash on him, but there's chances he could lose them, or run out before he gets his next fix. It'll also balance you trying to sneak in super speed/durability into his power mechanics.